This was announced back in December, but I just found out that Toonami will have a new TIE (Total Immersion Event) in the fall of this year. This new event will be called “The Forge”. Take a look at the official teaser, which is a cool 20-second 2D animated short. I have been reading about 3D printing for a while, but I haven’t had a chance to play with the technology yet. So I decided to test the waters by using a third-party 3D printing service, Shapeways, to print an object I created. I decided to make a small 3D version of my site logo, since I already had objects for the buildings. So I fired up LightWave Modeler and set up a single object with the buildings connected by a base. I had to tweak the buildings to make them printer-ready: all pieces must be fully closed, you cannot have stray polygons, all polygons should be tripled, etc. Newer versions of LightWave have a convenient command, “Mesh Repair” (in the “Detail” tab), that will evaluate if the model is ready for 3D printing. I recently discovered MakeHuman, an open source tool for creating 3D character models. MakeHuman is a standalone program that allows you to create a character mesh. 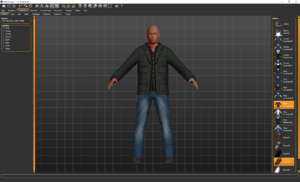 Then you can tweak the base model using sliders for dozens of features, such as head shape, torso depth, finger length, breast size, and many more. You can also add clothes and other accessories to your character within the application. In addition to the default clothes (named “Geometries” in the application), you can import community created accessories or even make your own in the 3D modeler of choice. And once you have your character model, there are preset poses you can use if you just want a static pose for a scene. Of course, if you want to rig the model, you can export using the A or T pose. Once you have your final character and pose, you can export the mesh to your choice of format. A simple male character I created using MakeHuman (click to view full-size image). MakeHuman is a useful open source application, but another developer, Manuel Bastioni, has improved on MakeHuman by turning it into a Blender plugin and adding significant improvements to the character generation. Many of the same model sliders are available within the plugin. Additionally, he created presets within each category that you can mix into your existing model. You can still use the preset poses in the plugin, but if you are going to stay in Blender then the character is already rigged for your own custom poses or animation! But I am most excited about the ability to use different base models. In addition to the standard realistic model, he added some anime-style base models, too. And if you create a character using the anime base model, all of the sliders will still work correctly even though the geometry is different than the realistic models. Unfortunately, I am not very familiar with Blender. However, by using the Maya interface control settings and reading the beginning of a Blender tutorial, I was able to quickly learn enough to play with ManuelLab and create a very simple anime character (see below). I also created the ultra-simple “tube top” she is wearing in LightWave, to test out how clothes are created and then applied within ManuelLab (mesh created in LightWave and then applied in Blender). A simple posed character I created using the ManuelLab plugin in Blender (click to view full-size image). If you need to quickly create characters and do not want to build your own character meshes, MakeHuman and ManuelLab are great tools to add to your arsenal. Enjoy! I finally looked into a more advanced animation pipeline feature named “linear color workflow”. The concept is simple: you can represent an image using a very wide range of values, thus preserving a very wide range of color values and brightness levels in a single scene. And if your entire workflow uses this high dynamic range data, you can perform sophisticated effects to the final image that are not possible when you are limited to the 8-bit integer RGB values that are normally used in JPG, PNG, and similar file types. Creating a marble texture in Maya is as simple as adding a single node. But you can use a more advanced node network to further improve the look of the material. This tutorial will show you how to assign a simple marble texture to an object and then build on that simple texture by adding additional nodes. By default, LightWave 3D enables a render option that could cause headaches when you get to the compositing step of your pipeline. 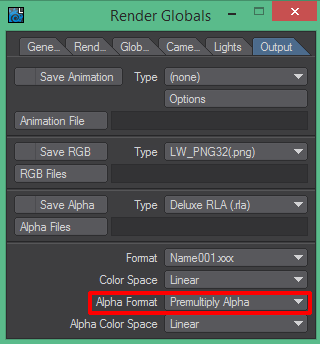 I am referring to the “Alpha Format” setting, which can be found in the “Output” tab of the “Render Globals” settings. When you first open a scene, LightWave sets the value to “Premultiply Alpha”. If you are rendering your frames without any transparency and you do not need to composite your renders together, this setting will not change the look of your final result. However, if you are relying on the alpha channel to control transparency of your renders and then compositing multiple renders into a single frame, this value becomes very important. And, unfortunately, the default is probably not the best setting to use. There is a new human-computer interface device on the market that lets you manipulate the cursor or even 3D objects by just waving your hands in the air. That device is called the Leap Motion Controller, and it is surprisingly inexpensive. Using infrared cameras, it can track exactly what you are doing with your hands and use that to control your mouse cursor or run specialized code written into compatible applications (similar to how pressure-sensitive tablets have even more options in Photoshop than just the operating system you are running).